Landon Donovan during a training session in Stanford, California. On Thursday night, the head coach of the U.S. men’s national soccer team, Jurgen Klinsmann, decided he would not be taking Landon Donovan to the 2014 World Cup. Given that Donovan is one of the most decorated and long-standing soccer players in U.S. history, the news came as a shock to many American soccer fans. But for those who follow the sport closely, Donovan’s omission from the roster wasn’t so surprising. Klinsmann and Donovan got off to a rocky start in 2011, when Klinsmann first took the head coaching job and Donovan decided to take a break from soccer. 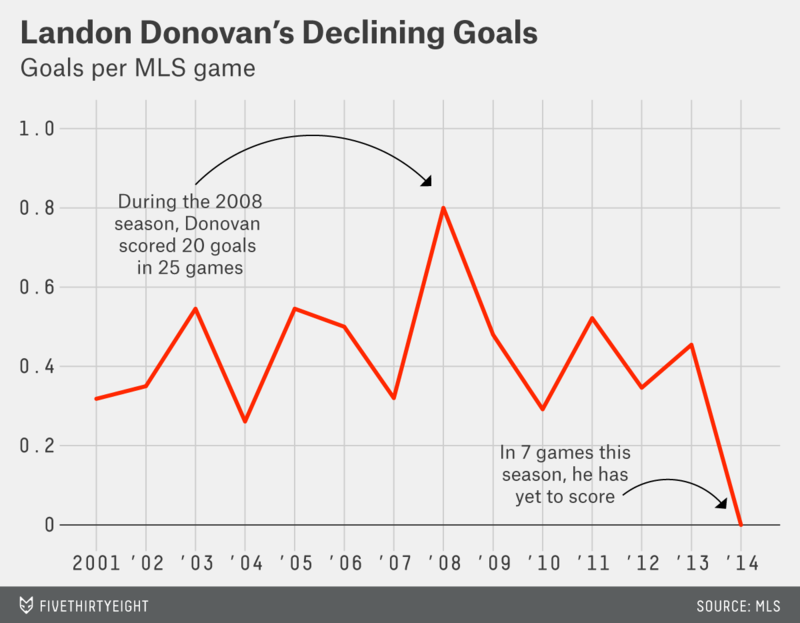 Since then, Donovan has been working to get back into Klinsmann’s player pool, but nagging injuries sidelined him for much of 2013. At age 32, Donovan appeared to have lost some of his pace and ability to finish. Since scoring Oct. 6 of last year, he has taken 32 shots with the LA Galaxy and men’s national team, but he hasn’t scored a goal. Similarly, over the past three years, all of Donovan’s offensive statistics have been declining: goals, assists, expected goals and passing expected assists. (ESPN TruMedia does not have data available before the 2012 Major League Soccer season for these statistics. Passing expected assists are a measure of how many goals we’d expect his passes to generate based on where players received the ball and other context.) 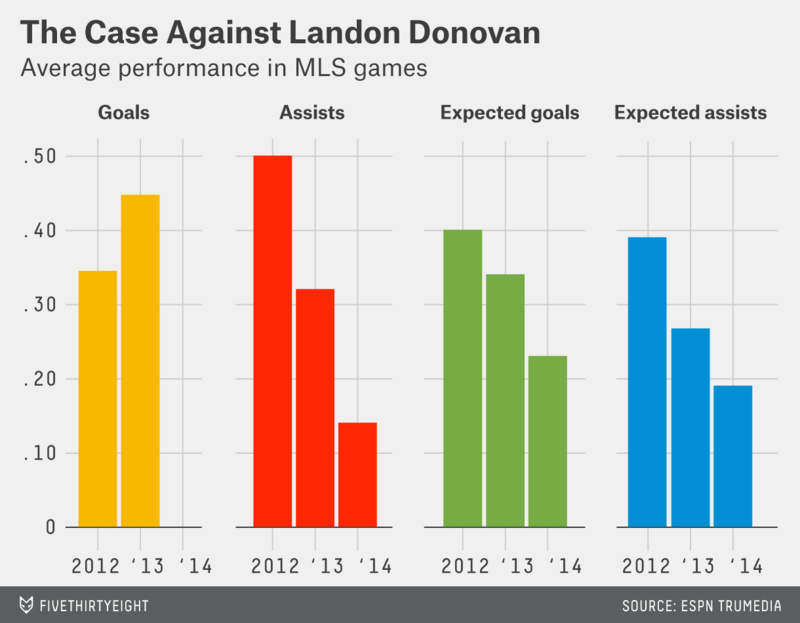 Donovan’s most recent performance makes a clear case against sending him to the World Cup. Klinsmann’s detractors are probably clinging to the memory of Donovan’s storied stoppage-time finish against Algeria at the 2010 World Cup, which sent the U.S. out of the group stage. No U.S. player has performed as well as Donovan in the past three World Cups in terms of goals scored (five), and he improved his ability to create scoring chances, complete passes and assists in each subsequent World Cup he played in. No longer finishing goals himself, the best reason to include Donovan on the squad in Brazil is probably his ability to create scoring chances for other people. Since the start of 2013, Donovan created 36 scoring chances in 12 games for the men’s national team — 15 more than any player going to Brazil. But four years is a long time, and a lot has changed for Donovan and soccer in the U.S. People expect something of the men’s national team this summer; simply qualifying for the tournament is no longer a point of pride. In previous World Cups, coaches might have taken a player along for his leadership qualities or experience, but Klinsmann has made it clear that a 32-year-old in bad form is not worth any amount of intangible qualities. It will be difficult to know whether Klinsmann made the right decision until June 26, when the U.S. finishes the group stage of the tournament. 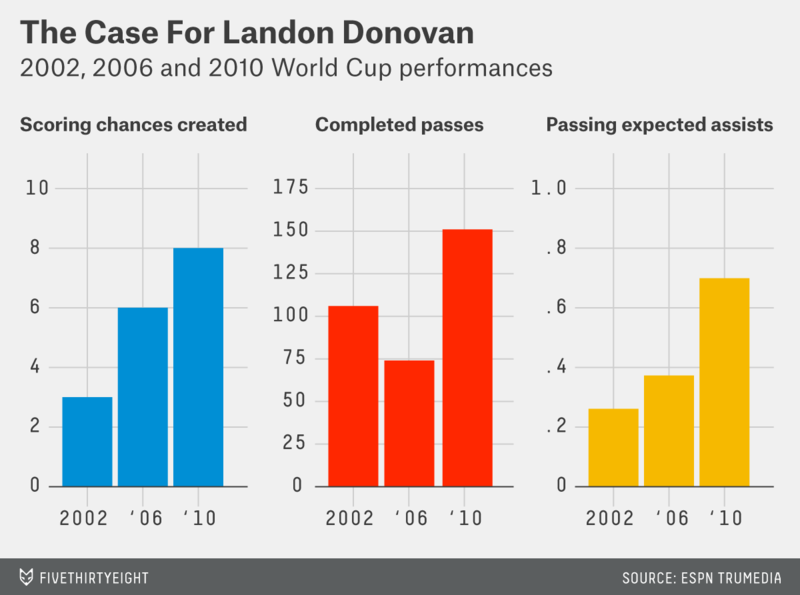 Because of Donovan’s name recognition and fan following, his absence might hurt World Cup viewership in the U.S. But the fact that the men’s national team is finally bigger than one player is great news for soccer in America.